CephsInAction opens the 7th FA1301 STSM call! 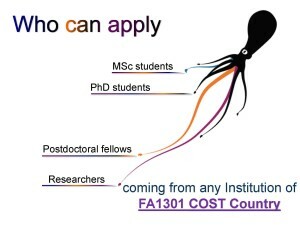 The call is for projects based on any aspect of cephalopod biology, physiology, neuroscience, veterinary medicine and animals’ welfare, including fundamental biological research, development and/or acquisition of novel techniques, aquaculture and fisheries. 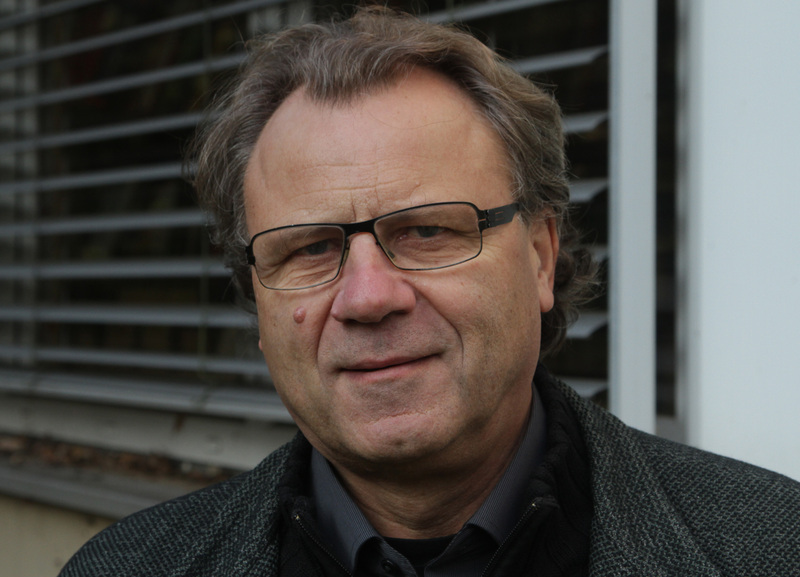 Projects should fit activities and aims of relevance for CephsInAction. For topic of interest, please see our MoU and Goals of CephsInAction. FA1301 STSMs serve to support the exchange of researchers to establish new areas of scientific collaboration within the areas of activities of FA1301 COST Action. 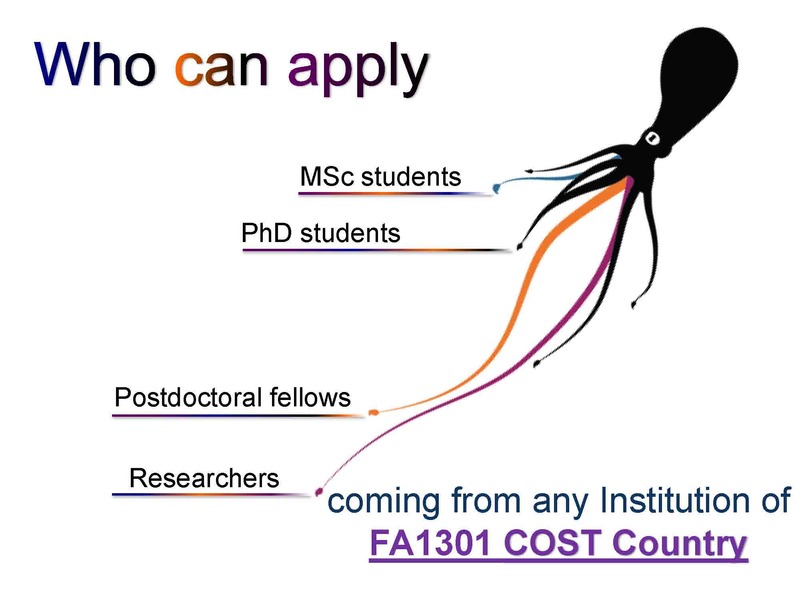 Priority is given to Early Stage Researchers (pre- or post-doctoral researchers) that would like to visit Institutions of the participating FA1301 Countries. The FA1301 STSM Committee will evaluate submitted STSMs projects on the basis of the pertinence with the aims of CephsInAction, and of the time-line and quality of the proposed project. The deadline is fixed to facilitate grouping of the proposals for evaluation purposes. Projects can start any time during the current Grant Period, i.e. from “at least one week after the deadline application” till the end of September 2017! 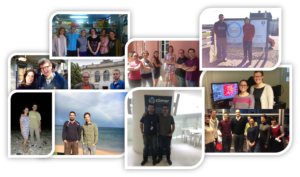 Short Term Scientific Missions (STSMs) are aimed at supporting individual mobility and at strengthening the existing networks and fostering collaborations by allowing scientists to visit an institution or laboratory in another Participating COST Country, or an approved NNC institution, or an approved IPC institution. All STSMs applicants must be engaged in a research programme, either as postgraduate students or postdoctoral fellows, or be employed by, or officially affiliated to, an institution or legal entity. This institution is the applicant’s Home Institution (Home Institutions can be both public or private entities). 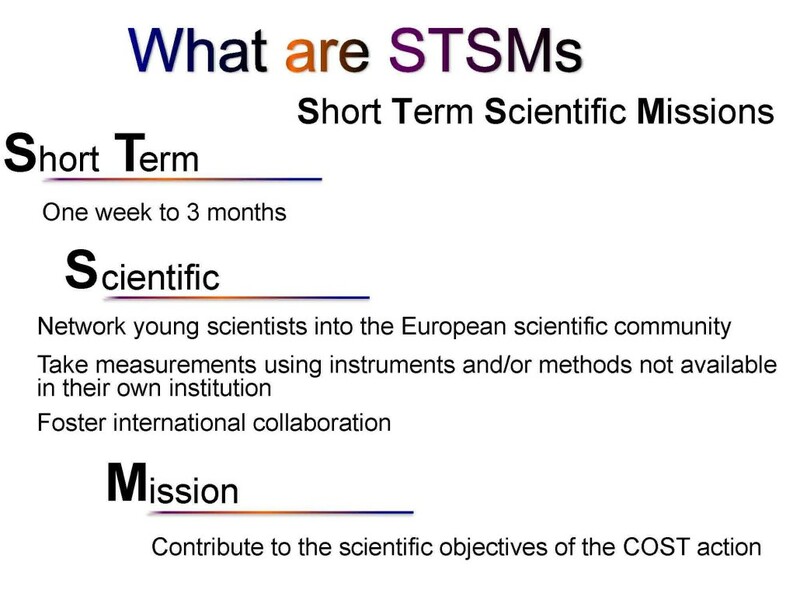 A STSM should specifically contribute to the scientific objectives of the COST Action, while allowing applicants to learn new techniques or gain access to specific instruments and/or methods that would not be available in their own Institutions. 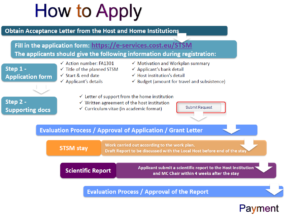 A STSM may only be approved: from a home institution in a COST participating country to a host institution in another COST participating country or to a formally approved host institution in a non-COST country. And from a formally approved home institution in a Near Neighbour country to a host institution in a COST participating country. Short-Term Scientific Missions between different Actions may be considered by the Management Committees of both Actions.The Applicant is responsible for obtaining the agreement of the host institution, before submitting his/her application. The duration of a STSM should be between one week (5 working days) min to a maximum 3 months. For Early Stage Researchers (less than PhD + 8 years) the Management Committee may approve an extension to a duration beyond 3 months, but normally not more than 6 months in total. The evaluation of STSMs applications is performed by the MC and must avoid any potential conflict of interest. The selection of applicants is based on the scientific scope of the STSM application. The aims of the STSM must be in line with the Action objectives. Issues such as geographical and gender balance should be taken into consideration during the selection process, and ESRs’ applications should be privileged. The Applicant should normally be engaged in a programme of research as a postgraduate student or postdoctoral fellow or be employed in an institution of a COST Country having accepted the MoU of the Action. 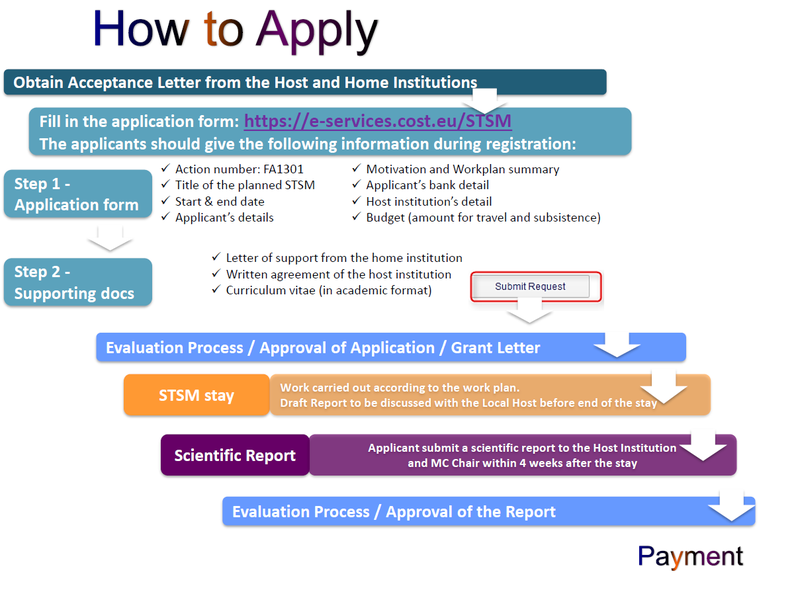 After filling out the online form, the automatically issued formal STSM application, together with the uploaded documents are automatically sent to the Grant Holder and STSMs coordinator. The STSMs coordinator is responsible for circulating the application to the assessment panel. The STSMs assessment panel is responsible for the scientific and budgetary assessment and taking the final decision for the STSM proposals. The STSMs coordinator has to send the application, together with the MC approval (the STSMs Assessment panel approval in our case) to the Grant Holder, respecting the deadline set by the Grant Holder. 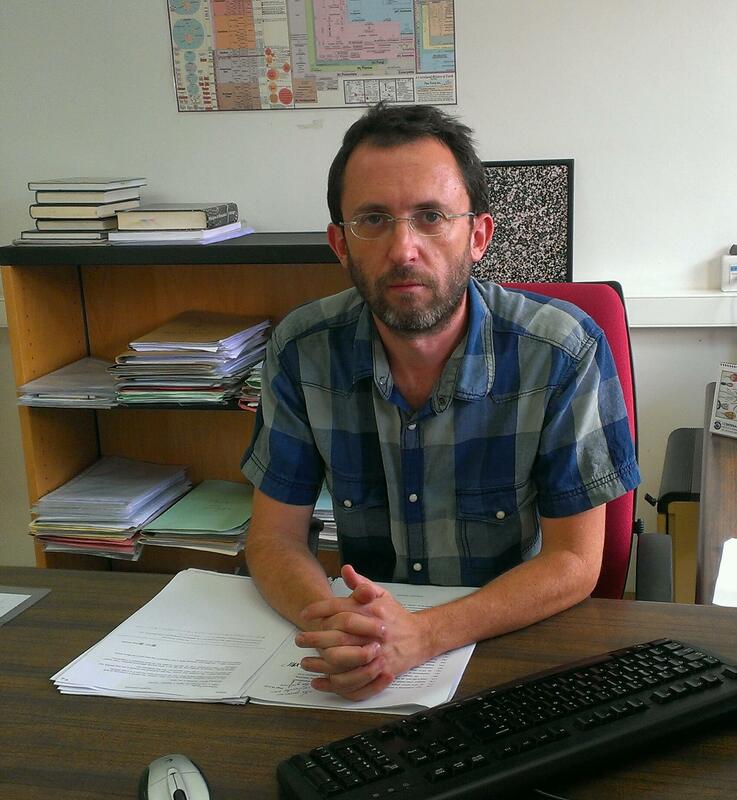 After checking the application for the compatibility with the existing rules and procedures, the Grant Holder will inform the Applicant about the outcome of the assessment, and will arrange the necessary formalities for the issue of the grant in case of a positive result and availability of funding. The STSMs Grant is a contribution to the costs of a STSM and may not necessarily cover all the costs in each case. The grant should normally cover only travel and subsistence. The financial contribution for a STSM will be fixed, based on the Applicant’s budget request and the evaluation of the application by the STSMs Assessment Committee. An amount of EUR 60 to 90 for the daily allowance in particular for longer stays and EUR 300 for the travel is recommended but not obligatory. 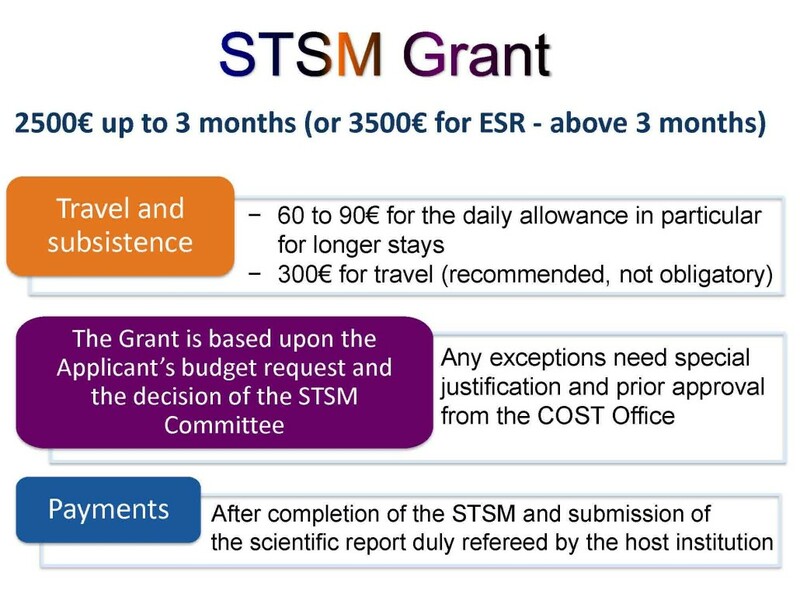 The total of a STSM shall normally not exceed EUR 2 500 up to 3 months (or EUR 3 500 for Early Stage Researchers – above 3 months). In any case the costs associated with the STSM must not exceed the limits set in the rules for reimbursement by COST of expenses for experts eligible for reimbursement. The grant amount will only be transferred after the successful completion of the STSM, and once the grantee has written a short report on the research visit.